Overview: Trees store carbon (C) taken from the atmosphere through the process of photosynthesis. Carbon is removed from the atmosphere as CO2. Photosynthesis combines H2O from the ground and CO2 from the atmosphere to form wood and releases oxygen to the atmosphere. This process removes a greenhouse gas (CO2) from the atmosphere by storing it as wood fiber (sequestered carbon). When plants die or are eaten, the process is reversed: oxygen is absorbed from the surroundings and carbon dioxide is released to the air, water or soil. This process is called the Carbon Cycle. A significant amount of atmospheric CO2 finds it way into the atmosphere through the activities of humans. The amounts and rates at which trees and forests store carbon compared to Canadian consumption of hydrocarbons provide students with insights into the extent to which trees help offset the CO2 released by our use of hydrocarbons. Forests cover approximately 50% of Canada’s land surface and play an important role in the carbon cycle. This protocol outlines procedures for determining rates of carbon sequestering for different species of trees in Canada and total amounts of carbon stored in a tree and in a selected forest study area. These calculations help students understand the degree to which their own carbon footprint is off-set by forest carbon sequestering. Plot selection: Schools use their 90 m by 90 m forestry study plots as a starting place for identifying a number of 10 m by 10 m plots. The 10m by 10m plots are chosen along the 90 m square baseline, at 10 m intervals. The 10m square plots are of a manageable size for the carbon sequestering studies. Students record the DBH (explained below) and identify the species of all trees greater than 5 cm DBH within each 10 m plot. Students then conduct a more intensive study on a subset of trees within the plot. They collect height and age information on samples of the different species of trees within the plot. This should include at least three trees of each species across a range of DBH. Students reference the location of their 10 m by 10 m plots using GPS. A table for all the trees within the plot is created so that students are able to calculate the net biomass for the trees within the plot using the Canadian Forest Services website. The core samples can be used to calculate the rates at which carbon has been sequestered by the plot. This process can be applied to each plot. Averages of the plots can then be applied to the 90 m by 90 m forest study area. Tree measurements: Students identify species and DBH of all the trees within the plot. They then measure the height and age of the sample trees of each species within the plot. Identifying the trees: Use a Regional Tree Identification book to identify the type of tree you are studying. There will be a number of trees of the same species in your plot. For example, white and black spruce, lodgepole pine, balsam popular, paper birch and trembling aspen are the most common species found in the Boreal Forest Eco-regions. Measuring the diameter of trees: To measure the diameter of a tree, we measure the distance around the tree (circumference) at chest height (1.35 m), then convert this to the distance through the tree (diameter) by dividing by 3.14. Record this DBH (Diameter Breast Height) in the table for each tree species. A special tape measure converts circumference to diameter when taking this measurement. These tapes can be made by marking each 3.14 cm as 1 cm on a heavy plastic tie used in lumber yards. Measuring the height of trees: To measure the height, use the clinometer showing tangents rather than angles. Move 10 meters from the tree. Site to the top of the tree and record the tan. Convert this into height by multiplying the tan by the distance you are from the tree (10 m). Next, site to the base of the tree and record the tan and repeat the height calculation, add the height to the base if it is downhill from the observer, and subtract the height if it uphill from the observer. Record the total tree height. If the tree is too tall, move to 20 m distance and repeat the process. Measuring the age of trees: The trees in the Boreal forest grow during the summer months and stop growing during the winter months. In the spring, trees grow most quickly because of all the moisture coming from melting winter snows and warm early summer temperatures. In the later summer, trees grow more slowly because of little moisture and cool evening temperatures. During the winter, the water freezes and trees do not grow at all. The early season growth shows as a larger, whiter band of cells in the rings of the tree. The later season growth shows as a darker band of smaller cells. As the tree grows a layer of wood around the trunk, it also grows in height. A shoot or leader grows from the top of the tree adding new height to the tree. The seasonal rings tell the age of the tree, how well the tree grew in each year and provide a record of the conditions that result in tree growth. Samples of tree growth are taken by using an increment bore to drill a sample from the outside edge to the middle of the tree. Try to take this sample as close to the base of the tree as possible so we do not miss many years of growth. The core sample is glued into the wooden sample holder. It is then sanded smooth to the rings can be seen more clearly. Count the year of each rings beginning at the outside ring as the year the sample was taken. Students should be able to date each growth ring starting with the year the sample was taken. The age of the tree will provide the information required to calculate the average rate of carbon sequestering. A more careful examination of the ring pattern will provide insights into the consistency of the carbon sequestering for each tree. Biomass Calculations: The Canadian Forest Services provides an online calculator that can be used to estimate the biomass mass of 41 indigenous forest tree species of Canada. The biomass equations provide estimates of bark, stem, branches and foliage, as a function of DBH and height. The analysis has been carried out so that the sum of the components gives an estimate of the total above-ground biomass. The underlying equations have been adjusted on thousands of trees that have been sampled across Canada as part of a research program on forest biomass carried out in the early 1980s. The equations are applicable across all of Canada. The trees were sampled in forested environments, and not in open or urban settings where trees can present different geometries. 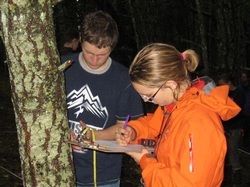 Students enter the collected information in the Canadian Forest Services website to calculate the above ground dry biomass of the trees surveyed. To this, they add the dry root biomass described below. With the age and volume data, students are able to calculate the average annual rate of carbon sequestering. Carbon Sequestering calculations: Estimations for root biomass are shown as a ratio of root biomass compared to the biomass of the above ground portion of the tree. These rations are based on numerous samples taken throughout Canada. Students use the CFS biomass above ground calculator, calculate the percent of root biomass then add the two masses. Select plot of trees to be analyzed for carbon sequestering rates. Record the diameters of all trees in the plot and select a subset for sampling height and age by taking core samples of trees from representative diameters for each species. Calculate the age of the sample trees using the dendrochronology protocols. Develop a journal recording sheet and a corresponding spreadsheet that permits an orderly calculation of carbon sequestering. Enter the DBH or the DBH and height into the CFS biomass calculator. Calculate the root biomass using the percentage of the net biomass. Add the root and above ground biomass to get the net tree biomass for each tree in the plot. Calculate the net carbon sequestered of each tree by multiplying the total dry biomass by 50%. Calculate the rate of carbon sequestering by dividing the net carbon stored in the selected trees by the age of the tree. Calculate the carbon sequestered in each plot by taking the sum of all the tree carbon within the plot.